Sorry... the 2017 GMC Yukon XL is no longer being sold as new. Instead, take the first step to a great deal on 2019 GMC Yukon XL with a free price quote! 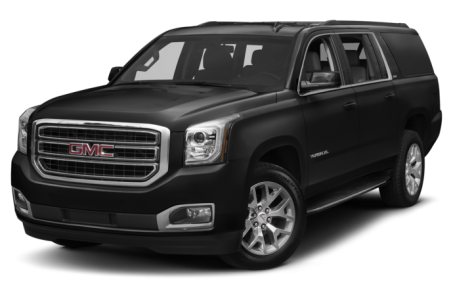 The 2017 GMC Yukon XL is the extended version of the full-size Yukon SUV. It competes with the Ford Expedition and Lincoln Navigator. This year, the SLT trim receives a Premium Edition package that includes chrome accents, 22-inch chrome wheels, and a polished exhaust tip. The Yukon XL has a unique front fascia compared to its cousin, the Chevrolet Suburban, highlighted by a large front grille adorned by the GMC logo and headlight clusters with large C-shaped LED elements. Its wheelbase is 130 inches, which is 16 inches longer than the regular Yukon. 18-inch alloy wheels, fog lamps, a luggage rack, and heated side mirrors are standard. The upscale Denali trim gets its own set of cosmetic updates, including a mesh grille, 20-inch alloy wheels, power liftgate, and HID projector-beam headlamps. A hands-free liftgate is now standard on SLT models. There are two available V-8 engines, one for SLE and SLT models and the larger reserved for the Denali. The Yukon XL is powered by a standard 355-hp, 5.3-liter V-8 engine mated to a 6-speed automatic transmission that makes 383 pounds-feet of torque. Denali models also get an EcoTec3 engine, a 420-hp, 6.2-liter V-8 paired to an 8-speed automatic that makes 460 pounds-feet of torque. The Yukon XL can tow up to 8,300 pounds with two-wheel drive, and 8,000 with four-wheel drive. The Denali checks in slightly behind that at 8,100 and 7,900 pounds respectively. Inside, GMC’s versions of GM cars have always strived to live upmarket from their Chevrolet counterparts and the Yukon XL is no exception. Extra attention has been paid to upgrading the materials and fit-and-finish of the latest Yukon XL. The cabin is quiet, thanks to better aerodynamics and redesigned side mirrors, which reduce wind noise. Standard equipment includes five USB ports to charge devices, HD radio, Bose premium audio, an 8-inch touchscreen with IntelliLink, Apple CarPlay/Android Auto compatibility, Bluetooth connectivity for phone and audio, and tri-zone automatic climate control. Denali models add active noise cancellation, a better stereo (also from Bose), leather seating, powered/heated front and second-row seats, and navigation. Depending on configuration, it can seat 7 to 9 passengers across 3 rows. Maximum cargo capacity is 94.7 cubic feet with the second- and third-row seats folded down. The Yukon XL also offers a lot in the way of standard safety equipment, including a backup camera and front/rear parking sensors which are appreciated for those who need to maneuver the Yukon in tight spaces.